With our impending move just a few weeks away, my life has been a flurry of packing. With the fresh start at a new house, I've started thinking ahead to how to more efficiently organize our life so that we can start on the right foot as soon as we move. One of the areas I know I can be working on is recycling. We made a concerted effort this year to be mindful of separating our trash and recyclables. But I was astounded by all the information I learned from the I Want To Be Recycled website. With Earth Day today, I spent some time reading over the facts and ideas, formulating a Family Recycling Plan for the New House. 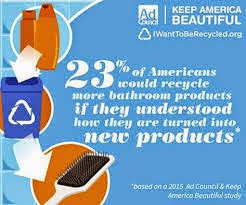 First, I was floored that so many bathroom items could be recycled. I've been missing out all these years! 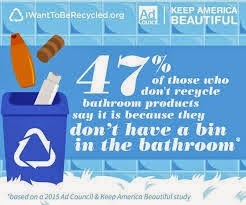 Second, why have I NEVER thought to put a recycling bin IN THE BATHROOM? This was first on our "Recycling Plan" and I can't wait to implement it. Third, I realize that I have two young souls watching me and learning about life from me. My daughter's will take a cue about recycling and being environmentally conscious from me. So, I really want to get this right! What action items need to be on YOUR Family Recycling Plan? This post was made possible with information from the Ad Council and Keep America Beautiful and I was compensated by Element Associates.